A few weeks ago we had the pleasure of recording the proceedings attendant upon the opening of the Lytham Branch Railway; and we have now the further gratification of noticing the festivities and rejoicings on the occasion of another important feeder of the Preston and Wyre line being rendered available for public accommodation. Important indeed the branch is, not merely to the interests of the shareholders of the parent line, but as affording increased facilities for the inhabitants of this and neighbouring manufacturing places, to pay a visit to the health-inspiring breezes of the seashore, and furnishing a further link in the grand network of railway communication, now being rapidly, extended over the whole kingdom. The Opening was fixed for Wednesday last, the day upon which the ordinary half-yearly and a special general meeting was held at Fleetwood; and, as it was understood that it train would be in readiness at the conclusion of the business to convey the proprietors to Blackpool, there was a much larger assemblage than usual of proprietors at the meetings. The day, too, was exceedingly fine, such a one as a Blackpool would only be too happy to bespeak on a sojourn at his favourite watering place. The utmost preparations had been made to give every possible éclat to the occasion, and make the whole festivities pass off in a way worthy of the event in honour of which they were held. The steam engines, carriages, &c., were adorned with numerous flags, as tokens of some auspicious event; the shipping and public buildings, at Fleetwood, bore similar emblems of rejoicings; the inns, church, railway station, dwelling houses, &c., at Blackpool, were similarly bedecked; and the inhabitants, generally, seemed to regard with much satisfaction the placing of the advantages of railway travelling within their reach. From an early hour in the morning, cannons were fired in honour of the occasion; and preparations had bean made for treats for the children of the Sunday schools, dinners to the workmen, and other public celebrations. In the course of the day, several trains passed to and from the Poulton station, to Blackpool, parties being allowed a free passage, and every arrival and departure was welcomed with hearty cheering from the numerous assemblages collected to welcome them. The processions of the Sunday school children were formed along the beach and streets of Blackpool, with innumerable flags and banners, and the hearty youngsters were treated with warm ale, buns, &c., on the spacious bowling green of the Talbot Inn. Not only, too, were the inhabitants of Blackpool alive, but the lads and lasses of the neighbouring villages were on the spot, and the crowds at the Blackpool station comprised a goodly assemblage of smiling beauties, whose gracious approval of the proceedings of the day were ever and anon expressed in looks and words. Here, too, as is Fleetwood, and along the line, the enlivening strains of music added to the general attraction. The Rochdale band, the Preston Church of England, and the Preston Blue Coat School band were in attendance, and their exertions were called forth at intervals during the day. The Blackpool Railway branches from the main line a little beyond the Poulton station. It is three miles and a half in length, and tolerably level, excepting a slight inclination on nearing Blackpool, and with but little curve. There is only a single line of rails. From the favourable character of the country through which the line passes, and the good spirit in which the directors were met by the landowners on the line, the cost of the undertaking has been only from £4,000 to £5,000 a mile. 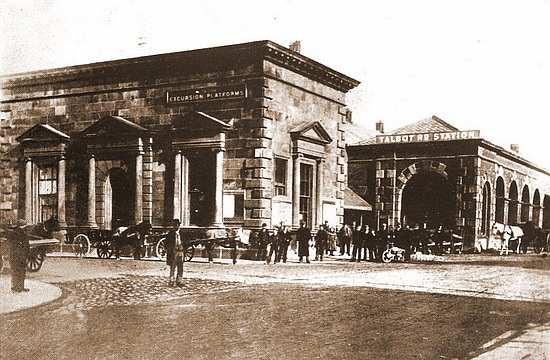 The station is in Talbot-road, the new road out by Mr. Clifton a short time ago, and which brings into an advantageous situation for building land his property in Blackpool, It is built from the designs of Mr. Bawling, of Fleetwood, in the Ionic order. It is an exceedingly spacious and well- planned building; the general arrangement is pretty much the same as the Lytham station but larger. When completed, it will be a great ornament to that part of Blackpool. The contractors for the work are Messrs. Towers and Westall, of Fleetwood; the works on the railway have been executed by Mr. Jardine. The opening train, for such the one from Fleetwood, conveying the directors and shareholders was considered, arrived at Blackpool immediately after four o'clock, about half an hour before the time fixed for dinner, and was greeted by the assembled multitude most enthusiastically. The dinner in honour of the occasion was held at Miss Nickson's, the Clifton's Arms Hotel, and comprised every delicacy of the season, served in a style for which the house is celebrated. The fineness of the day had induced so many of the shareholders to attend, that there was scarcely accommodation for all who wished to join the feast. About 150 sat down, Clement Royds, Esq., being in the chair, supported on the right by Captain Evans, R.N., W. Taylor, Esq., T. German, Esq., mayor of Preston, D. Glib, Esq., Hugh Hornby, Esq. ; and on the left by J. Laidlay Esq., J. Dewhurst, Esq., T. B. Addison, Esq., E. Tootall Esq., &c., &c.
The Chairman proposed in succession "The Queen," " The Queen Dowager," "Prince Albert, and the rest of the Royal Family," "The High Sheriff," and "The Lord Lieutenant of the County," which toasts were duly honoured. The last was acknowledged by Hugh Hornby, Esq. The Chairman next proposed the health of the Lord of the Manor, to whom they were much indebted for the successful prosecution of the undertaking opened that day. (Applause.) Mr. Clifton had been, he was sorry to say, prevented, by the indisposition of his wife, from being present that day. Mr. Fair assured them that Mr. Clifton was highly complimented by the attendance of the gentlemen who honoured him with their company at the opening of the Lytham Railway, and he would have been happy to have returned their kindness by being present that day, had not the serious, Indeed dangerous, illness of Mrs. Clifton prevented him. He was glad to say, she was now, however, considerably better. On Mr. Clifton's part he thanked them for the honour conferred upon him. The Chairmen gave, with a suitable eulogy, the Mayor of Preston. The Mayor, in rising to return thanks, was greeted with loud applause. He congratulated them on the opening of the Blackpool Branch, and the general prospects of their line. They had conferred a great benefit on the inhabitants of Blackpool and the community generally, and be hoped the Chairman, and all interested in the undertaking, would be amply rewarded for their spirited exertions to promote the public convenience. The Chairman proposed the Army and Navy. Captain Evans returned thanks on behalf of the navy, for the honour conferred upon the profession to which be had the honour to belong. He hoped that whenever their services were required for their country, they would be found as useful as they had before been. Captain Parkinson also returned thanks. Mr. Kemp returned thanks for the truly flattering manner in which Sir Hesketh Fleetwood's name had been received. He had hoped his enterprise would be for the public good and also be for his own, benefit. (Cheers.) He had acted always with 'the best feeling, and if the railway had been productive of good to any district or individual, Sir Hesketh would be well pleased. The Chairman next proposed the health of a gentleman present, the Recorder of Preston. Mr. Addison cordially thanked them for the honour conferred upon him as Recorder of Preston. He felt interested in all that concerned Preston, which was the capital of the hundred of Amounderness, and, indeed, of North Lancashire; and he saw with particular pleasure that these undertakings were mainly owing to the enterprising spirit of one individual, and he the representative of Preston. But he (Mr. Addison) also filled another office, though perhaps not known to most of them, being Chairman of the Preston and Longridge Railway Company. Like the Preston and Wyre, the Longridge company had been slow scholars; they lead been a long while in learning to spell the word "Dividend." (Laughter.) But latterly they had much improved, and they had just declared one of 8s. a share. Ho trusted he should aeon be able to appear among them as a shareholder of their own line, for the Longridge railway stood like a bride awaiting her nuptials (laughter); although she did not bring a very large fortune with her, she was willing to join her fortunes with the 'Preston and Wyre, and he trusted their union would he to the advantage of both, (Cheers,). The meeting then broke up, a special train being in readiness to convey the company to Preston. Some of the party, however, remained a further time in Blackpool, a second train being obligingly placed, at their disposal by the company, to leave at a later hour. In the course of the day, upwards of 40 workmen were regaled with a good old English dinner, with plentiful libations of "home-brewed," at Mr. R. Carter's, the Talbot Hotel. Mr. Jardine, contractor, occupied the chair, and the whole proceedings passed off with the best feeling. Indeed the whole of the celebrations attendant upon this auspicious event passed off in the best manner ; and much commendation was bestowed upon the hospitality, courtesy, and general kindness of the officers of the railway, in their endeavours to add to he enjoyment of the numerous company assembled to do honour to so important an event.